The Equality Act of 2010 prohibits discrimination in employment on the basis of gender, with a few exceptions, for reasons like national security, to allow for targeted provision of essential services like Womens’ Shelters, for monks – but not for people punting food for profit, as far as we can ascertain. Discrimination in employment is hardly a new phenomenon: it’s not just the obscene pay gap between genders, it’s also the assumption – and therefore reality – that so many jobs are and will always be gendered. We assign work a gender, and value the men’s stuff more and the women’s because we value men more than women. It appears Masala Twist are prepared to allow women to be looked at for the delight of their punters, so long as there are an equal number of men to do the “real work” – but they definitely aren’t allowed to do the proper “men’s work” in the kitchen. There’s a far broader question about how many employers behave like this in practice, even if they aren’t blatant enough to make a sign about it and stick it up in their windows. As someone with a decade plus experience in the catering industry, I know the answer to that. Pretending sexism, ageism, classism, racism, and every kind of conceivable prejudice aren’t a fundamental part of the way employing people works would be lying. It’s part of the mutually self enforcing culture that keeps the people at the bottom at the bottom and it’s most acute in “customer facing roles.” You’re not getting a job “front of house” unless you meet pretty exacting standards of beauty and gender conformity is a pretty big part of that, you’re not even getting a job in a call centre unless you learn to get rid of the bits of your accent you’re not supposed to have. 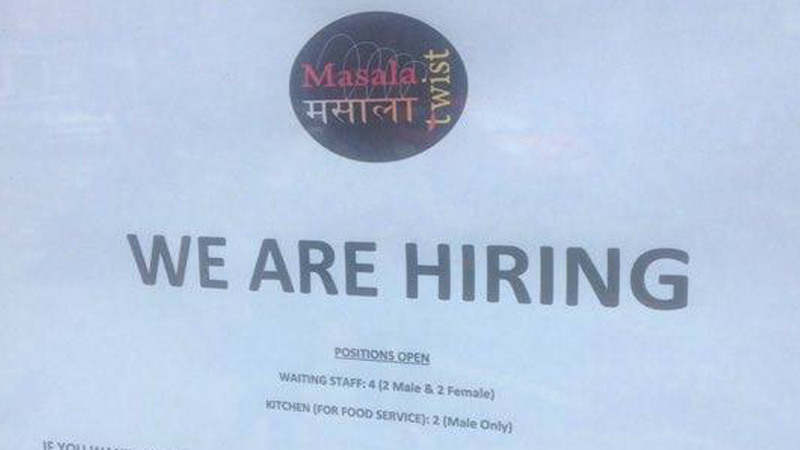 We hope Masala Twist clarify why exactly women can’t work in their kitchen or what makes them exempt from the laws on gender discrimination – but I’m not likely to be sending my CV or eating there any time soon. “……his intention was to replace the staff with same gender as the current staff working with us…” … Such an action would be illegal.